Physics Buzz: Fermi Problem Friday: Is World Cup Fever Killing People Who Watch Too Much Futbol? Fermi Problem Friday: Is World Cup Fever Killing People Who Watch Too Much Futbol? According to recent stories coming out of China, at least three soccer-obsessed fans have died after seeing too much of the world's favorite sport. The news should probably make me a little nervous, I suppose. I've seen every game of World Cup, either live or recorded. 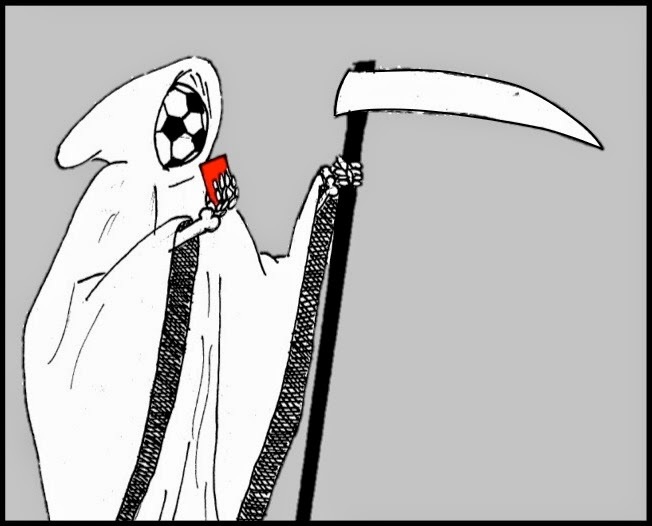 The articles about Chinese deaths suggest that the problem stems from the time difference, which exhausts futbol-addicted fans who are forced to watch games in the wee hours. I'm in the US eastern time zone, which isn't far removed from Brazil time, but I still watch at least two games very late every at night because I can't sit at my desk screaming "goooooooooooool" all the time. The scary thing is, while I don't know the specifics, I'm pretty sure that around 27 deaths in the US were associated with the game between team USA and Ghana alone! In other words a randomly chosen person has one chance in 876,000 of dying in any given hour. Because these people were watching the game at the time of their passing, it's safe to say that their deaths were equally as associated with the game as was the case for the three unfortunate folks in China. Another way to calculate the same thing is to look at mortality rates. According to the Centers for Disease Control, about 800 people out of a population of 100,000 will die every year. So for a 1.5 hour game, that means about 21 deaths. 1) Where is the outrage? How can we let a silly game be associated with so many deaths and not see reports of it nightly on the news? 2) Only three World Cup Fever deaths have been reported in China this year - why are so few people dying in China during the World Cup? Could it be that watching soccer is somehow a prophylactic? I suspect most of you know the answers to those questions, so I'll just leave them out there for now. Weigh in on them with a comment, if you want to share. You aren't accounting for age. The average age of people during the game's time frame is probably much different from the average age of people actually watching the game. How would you account for that? I'll be happy to add it in to the calculation. I also don't account for gender. I would guess that more men watch the games than women, and men have shorter lifespans so the number would go up.